Scientists have found that lazy people have more active brains. They have to spend a lot more time thinking about how to avoid work! I’m not being lazy here, just wandering in a water colour way through the garden to pick flowers. Then came upon this tiny sprite!…. Old photo but created picture today. 1. It’s a good fairy and not an imp. If I listen carefully she will give me good advice! 2. Downloaded some music scores and tried to play them but they were weird. I continued to play - ‘By the Time I get to Phoenix’ Not weird! 3. Found John’s pilot licence at the back of a hall cupboard. Very precious history! Quite a creative day, all in all. I hope you got that good advice you wanted. Wonderful editing! Love your little fairy. @helenhall Thanks Helen - she said......"Don't worry what other people think. Personality begins where comparison leaves off. Be unique. Be memorable. Be confident. Be proud"
A real story book picture! You look very cute with your hat & pointy green shoes. Th little sprite is perfectly at home among your greenery but perhaps hoping for warmer weather! A pilot too, John is very versatile! Not lazy taking time for oneself is a good thing indeed. I am sure the little fairy reminded you to BeYourself. @rontu Best advice ever, Linda! @happypat The mushroom that the fairy was sitting on was bought at a shop near you when I visited you those years ago! I think the scientists might be right - sounds like my husband! Love your very imaginative processing. @maggiemae Oh a John Ditchfield mushroom! Very near us! I wouldn't have guessed! @maggiemae - oh I like what she said - especially after having sorted out that she said 'comparison' and not 'compassion' which I read three times before my brain figured out the letters before me. @happypat I think John Ditchfield worked with glass, Pat? This one is made of walnut! @helenhall They both work but mean something different! 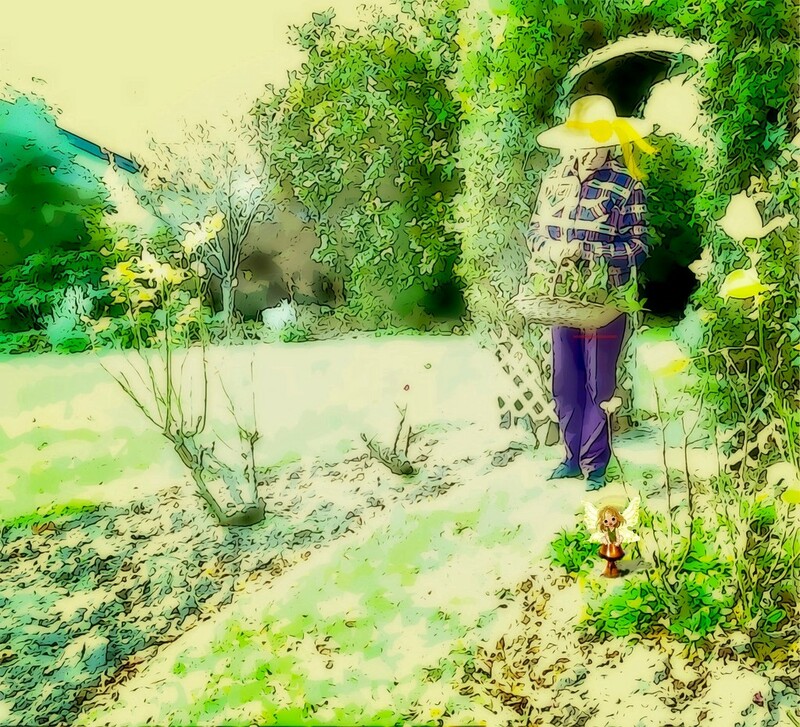 Love seeing you in your garden and edited so artistically. @maggiemae Yes JD uses glass, he specialises in mushrooms that's why I thought yours was from there. Wood will be nice! I love the processing, what a fun shot. The little sprite looks so cute. @grammyn Surprisingly enough this photo was taken 3 years ago! Fairy wasn't around then, though! Love your sense of whimsy, very amusing. A very cool edit choice! I have an active brain, but only for the creative...not for paying bills, cleaning or anything mundane. Haha! @gardenfolk Mrs CeCe - I get all enthusiastic about photography and cooking - with a glass of wine! @maggiemae Hahahahaha! :). Me too! What a bizarre thought - a more active brain from inactivity!! I like this and am reciting the nursery rhyme as I look at the image. Mary Mary...... how does your garden grow @casablanca ! No silver bells here just a sweet little fairy with good advice! Like your processing - so that explains why I'd much rather faff about with the camera than do the housework! l like the story this shot tells, but are you sure that's not Yolanda dressing up? @olivetreeann ha ha! No,she's much smaller than me, Ann - that hat is far to big for her! @maggiemae I meant your little fairy. @olivetreeann Oh, now that could have been so - never thought of that! I thought the lady looked like you. qute little fairry. @bruni It was me - the photo taken some time ago and I'm still wearing those trousers! Mushroom and fairy put in today!